Modeling and Control of Infectious Diseases in the Host Hernandez-Vargas Esteban A. Add to cart the livre of Hernandez-Vargas Esteban A. 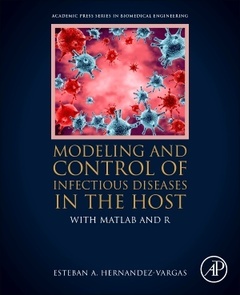 Modeling and Control of Infectious Diseases in the Host: With MATLAB and R aims to provide the adequate background between modeling and biology to bring a holistic understanding of health and disease, provide quantitative decision making to influence the discovery and development of drugs, and propose new computational algorithms to overcome the challenges of systems medicine. This book presents recent modeling advances in different viral infections, dissecting detailed contributions of key players to severe viral infections as well as their respective interactions, which is crucial for developing prophylactic and therapeutic strategies. By combining tailored in vivo experiments and mathematical modelling approaches, this book clarifies the relative contributions of different underlying mechanisms within hosts of the most lethal viral infections: HIV, influenza, and Ebola. Illustrative examples for parameter fitting, modeling and control applications are explained with its corresponding programming code using the software MATLAB and R.
Esteban A. Hernandez-Vargas is a research group leader and principal investigator at the Frankfurt Institute for Advanced Studies, Germany. In 2011, he obtained his PhD in Mathematics from the Hamilton Institute at the National University of Ireland. During three years, he hold a postdoctoral scientist position at the Helmholtz Centre for Infection Research (HZI) in Braunschweig, Germany. In July 2014, he founded the pioneering research group of Systems Medicine of Infectious Diseases at the HZI. Since March 2017, he and his research group moved to the Frankfurt Institute for Advanced Studies. Furthermore, he was a visiting scholar at Los Alamos National Laboratory (USA) and Universidad de Guadalajara (Mexico) and adjunct lecturer at the Otto von Guericke Universität Magdeburg, Germany. He has written more than 50 peer-reviewed publications. He is a member of the IEEE Control Systems Society, the Society of Mathematical Biology, the European Society of Virology, and the Mexican Research Council (CONACYT). Additionally, he is an Editorial Board member of Infectious Diseases of Frontiers in Medicine and Public Health Journal as well as a Research Topic Editor at Frontiers of Microbiology and Frontiers of Immunology. He is also involved in a number of IEEE and IFAC Conference Organizing Committees.